What’s the goal of this research project? The underlying objective of this research project is centered on a small-scale front and its associated biological activity. A front is a meeting of two water masses, and oceanic fronts are generally broken up into several broad categories, depending on the physical environment and phenomenon that cause these water masses to converge. Oceanographers have been interested in fronts for a long time, because they tend to be areas of high productivity. The elevated productivity at fronts is a result of the converging water masses physically aggregating many marine organisms. Small-scale fronts are, as the name suggests, smaller in spatial scale: they tend to occur on the order of tens of kilometers instead of hundreds to thousands of kilometers like some of the other major fronts. Small-scale fronts occur frequently, but have also been harder to describe because they are more ephemeral than large fronts. 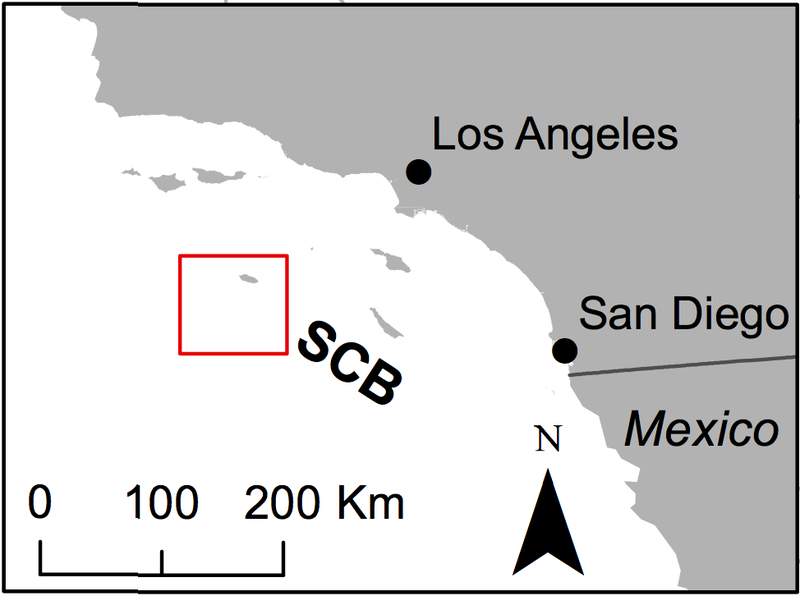 We set out to study one particular small-scale front in the Southern California Bight (SCB, see map for study region) because it was in an area that has received long-term oceanographic investigation – it is always good to do studies where there is lots of baseline data. We were primarily interested in exploring what biota was out there and seeing if there was biological aggregation at the front. Indeed there was! We saw a large aggregation of our now favorite jellyfish, Solmaris rhodoloma, at the front and described it in a 2012 research paper. You don’t have to worry about reading it. It basically says what I just told you: we found a lot of Solmaris at this small-scale, salinity-driven front. One of the interesting things about Solmaris is that they are part of a family of medusae that predate exclusively on other gelatinous zooplankton. They have been known to eat arrow worms and doliolids, but now, because of our images, we also think they are eating larvaceans and small siphonophores as well. So finding the large aggregation of Solmaris actually generated another research question for us: what’s going on with the rest of the gelatinous zooplankton at and around this front? What are the main processes driving their distribution? Is predation pressure from Solmaris affecting them in any way? It turns out that the second question is much harder to answer than you would think. Not knowing exactly what Solmaris is eating, and how long they’ve been accumulating at the front makes it difficult for us to tell if they’re just happening upon a patch of prey or they have already eaten everything around them. One approach is to determine the movements and directions of the organisms, which is why we’re asking you to measure their orientation. We hope that knowing their orientation (and that of their potential prey) can help us model their movement patterns and “age” the Solmaris aggregation, so to speak. Of course, it’s possible that even with this data we will still not be able to determine how long Solmaris has been aggregating at the front. However, this kind of orientation information has never been acquired for jellyfish of this size and at this scale, so any data we gather will be new and interesting! This is just one of many questions that Plankton Portal can help answer. The biological data contained within these images can bring us closer to a greater understanding of zooplankton ecology in general. Understanding the abundance, distribution and biomass (that’s where the size measurements come in) of this extremely understudied group of organisms – the small gelatinous zooplankton – can help us assess their broader impact in the marine food web, contribution to carbon cycling, and even help us learn how to identify hotspots of marine productivity in the future. This is how research grows and develops: it starts from a small, initial question (“hmm, I wonder if there is anything interesting at a small offshore front?”), which leads us to additional questions, and down the road, will hopefully help mankind appreciate and better protect its precious marine resources. Thank you for your help and participation in Plankton Portal – you are contributing to a more knowledgeable future and hopefully one where we can better care for the sea around us. 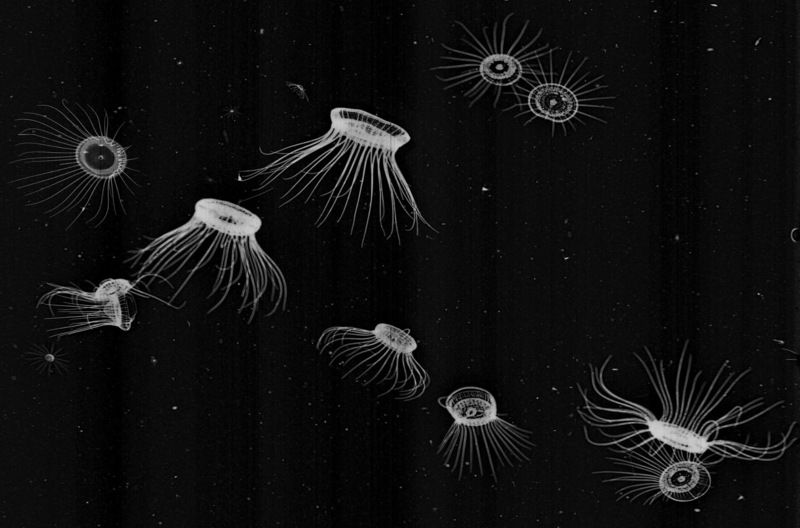 This entry was posted in Plankton, Science and tagged background, gelatinous zooplankton, ISIIS, jellyfish, orientation, plankton, predator-prey dynamics, purpose, research, research question, science, size, solmaris, study, zooplankton by jessicaluo. Bookmark the permalink.